Is that an excited face or what?! We had a great birthday party on Saturday. Lots of friend and family, Addie is still talking about it. We gave Addie a new bike. It's one that starts as a trike and converts to a 2 wheeler. The first thing she said was, "Can I have a Pink one?" Nope, sorry honey, it only comes in red. And when everyone else left, the cousins, Aunties, Uncle and Grandma & Grandpa were still there to play. The 4 cousins all get along so well. There are more... I just can't think of them right now. My baby turned 3 yesterday. We had a great weekend playing with our friends the Hennemann's at the cabin. The Hennemann's are moving from Florida to Alaska (talk about serious culture shock!!) and were just passing through on their trek north. They have a little girl who is exactly 2 months older than Addie and a 8 month old baby. So Lily was gaga over the baby; calling her Reese (her baby friend from daycare) all day yesterday. Addie and Ellie played as only 3 year old girls can play. They played with their babies, had a rousing game of Hungry Hungry Hippo (or Oh So Hungry Hippo as the girls were calling it), bounced on a giant inflatable castle, watched Sleeping Beauty, and generally just had a great time. 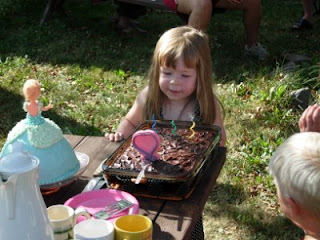 We brought some presents to the cabin and Grandma Argh made a cake so we were able to celebrate Addie's birthday. We'll have a big party next Saturday. In the meantime, everyone is glad to be home. Lily has been running a fever all weekend so she's feeling pretty crummy. It was 103 last night, but seems to have come down some. She's pushing teeth through but she must have a virus on top of that. Poor little thing. Here's a picture from the Optimist Club convention at the first of the month. 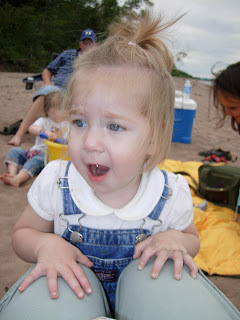 Our "evening of fun" was a train ride up the north shore of Lake Superior. It also included a pizza dinner. That's always an issue with Lily around. I couldn't really special order a cheeseless pizza like I would normally order since you pretty much just get a 1/2 pizza per person and they're all the same. So... I brought Lily's lunch bag with me filled with cheeseless pizza (I keep leftovers in the freezer and just take out a piece or 2 as needed. ), fruit roll-ups, juice boxes and other special treats that they don't usually get. Luckily I didn't have to worry about contact allergies with her so I didn't freak out about her touching the seats or anything. My little sister came with us on the train and was a HUGE help. Since there was no table there was really no way to keep the kids confined while eating other than on our laps. Notice that I was an idiot and wore white pants that day. Addie did make new friends with a couple from St Cloud (Jim & Jimmy according to Addie) - I've known them for awhile now and they really are the sweetest couple. By the end of the night Addie was giving Jim hugs and kisses! It really was a lot of fun and I'd definitely go again. I've failed as a mother. My 16 month old can say "sponge bob" when she sees him on TV. Here we are, just hanging out, eating our crackers, watching a Disney movie while Mommy, Auntie, and our 2 Grandma's make cards. Yep, we're pretty cool. Momma would never let us eat crackers in bed at home! In other news, we're counting down to Addie's 3rd birthday. She's very excited about bringing cupcakes to daycare and about her party! She is telling anyone that will listen that she is having a party. 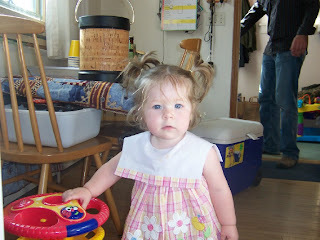 Can you believe that this was Addie at her 1st birthday party? Boy she has grown! Addie keeps telling me that "Now I all grown up Momma." It just about breaks your heart! She's definitely becoming a big kid. The first week in September she'll move downstairs to the preschool room at daycare. That will be very hard for me! The girls had a great time at the beach on Sunday. We got together with the FOP for a picnic. Although Adam works with all these folks, the families don't often have a chance to get together and play. Addie immediately stripped down and waded into the lake. That's really saying something since the average temp of the lake is 37 degrees F. Addie really didn't seem to mind though! We spent a lot of time collecting rocks (that I need to remember to take out of her pockets before the shorts go through the wash). 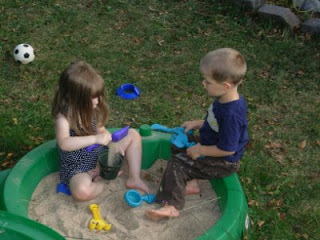 John O taught Addie to make a really good sandcastle. 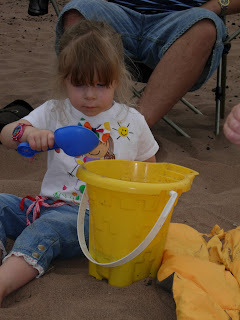 She spent a lot of time shoveling sand into her bucket. 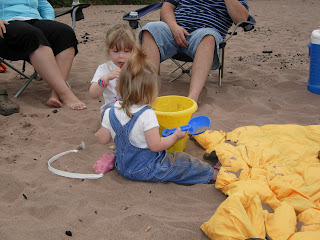 Both girls were covered head to toe in sand by the time we got home. 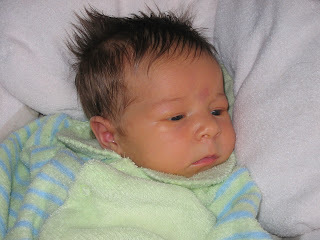 I'm still trying to wash the sand out of Addie's hair. I've pretty much given up the fight against sand in the carseat - I figure it's a lost cause. Never underestimate the abilities of a 16 month old! This morning I was putting on my makeup in the living room so Lily wouldn't be lonely (Addie decided to sleep in until 10am when it was time to leave for daycare). Lily wanted to play with my makeup so I gave her a tube of lipstick that I didn't think she'd be able to open. She opened it. She stuck her fingers in. She looks like she had been in a horribly traumatic accident. When I brought her to daycare she still had lipstick under her eye. I heard the daycare teacher commenting on her pretty sparkles on her face! Lily and Addie want to give a shout out to all their friends in Cell Block D! (get it? Jail, D...) Also all their love to the Comm Center!